I had a second cousin on my dad’s side who was older than me; her name was Lois. She was a big, warm-hearted person with a nice laugh who was always nice to me. My dad, who was never the social sort, really liked Lois, too. And like many children, I wasn’t sophisticated enough to understand the whole relational thing, so Lois was always “Aunt Lois” to me. When I was about twelve, Lois developed leukemia. I remember many nights I spent praying for Lois. In fact, I think I prayed for Lois more than anyone or anything I can remember from that time. I remember reading verse after verse about how God heals. I prayed my heart out for Lois. She died a little more than a year later in her young thirties. I was so broken up by this that I did not want to go to the funeral because I thought it was my fault that she died. Part of my childhood died with her. Friday, I had to take my four-year-old son to the emergency room at the local children’s hospital. Despite my constant care and attention (and only three hours of sleep each on Thursday and Friday AM), I could not keep enough fluids in him to prevent his getting dehydrated. He entered that vicious vomit cycle of losing so much water from his system that adding it only made him more nauseous. In the end, nothing could stay down. He awoke Friday morning looking like one of those hollow-eyed waifs you see in ads for Third World children’s charities. It was the look on his face that broke something inside of me. That look reminded me of how I felt when my dad came into my room late one night to tell me that Lois had died. The expression I must’ve given my dad then was the same one I now saw in my own son’s eyes. In that teachable moment, I tried to distill the ideas of special grace versus common grace to him, to tell him that God heals alone and sometimes He uses doctors, but that hurt look remained. There was the chink in the armor of childlike faith in a little boy whom I wished would never lose that simple faith that children seem to be born with, the faith Jesus commends for all of us. He didn’t say much to me the rest of the afternoon. They turned the TV on in the room they gave him at the hospital, and through much of the four hours we were there watching the electrolyte solution plump him up like air in a deflated balloon, he was glued to Nickelodeon’s snarky cartoons for adults packaged for kids. When I’d had enough of the veiled references, we switched to Nick, Jr. Me, the one with all the answers, didn’t seem too filled with them in that moment and I couldn’t compete with the TV. And though he didn’t once cry at the hospital, despite the IV dripline jabbed in his hand, he cried when he got home over a waxed paper pill cup he’d clung to during the whole ordeal; I’d thrown it away as we were leaving the emergency room. He’s physically fine now. And though he’d already seen a brain full of TV, his mom and I had rented Singing in the Rain and wanted to watch it before we had to take it back to the library. My son laughed his head off during Donald O’Connor’s “Make ‘Em Laugh” scene, and for a while everything seemed like it had always been. I was a sheltered child. Even at in my 20s, I was pretty naïve. I regret none of that. Yet trying to preserve childhood today is an effort I think all of us underestimated when we started having babies. I thought I knew how to handle every possible outcome, but I didn’t know what to do about the look of abject disappointment I saw in the eyes of my own child when he realized that God was not going to make him better there and then, and that a trip to the doctor, and then to the hospital, was the only outcome. In that moment was a slow leaching away of the reservoir of childlike faith that Jesus loved in the children He blessed. Millstones. I started thinking about millstones we tie around the necks of people less spiritually mature than we are. Had I said something in the past to my son that setup the expectation that was not fulfilled? Not as far as I knew. Though I’m relentless in turning what he hears of naturalistic explanations for life back to explanations of the workings of God in Creation, I must’ve left open a chink. Adults put on the full armor of God through the spiritual disciplines and intense discipleship. 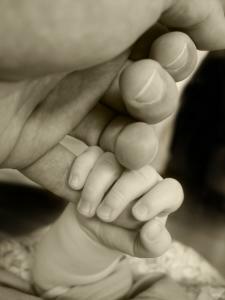 But children must don that armor through the grace of God working in their parents’ personal instruction. With so many forces of darkness attacking from untold directions, I often feel unprepared for that task. The last thing I want to see happen with my son is for me to fumble the answers, to fail to provide his cover as he moves into adulthood. It’s that look of innocence lost in a child’s eyes that should chill every parent to the bone. Today would have been my mother’s 71st birthday, but she only made it to 67 before brain cancer shortened her life. We never know how fast or how slow our parents will die. When my mom was diagnosed, we knew her condition would deteriorate just long enough to give us time, but slow enough to cause great grief as a vital woman was reduced to a shell of herself. Nor did we predict that my father would drop dead unexpectedly, less than four months before my mom did. I say this to ask all you who have both their parents alive now to make a decision today to never put your parents into a home. It may mean that you have to accommodate them as they die. You may have to move one parent in with you if the other is unable to care for them for whatever reason. It may mean you have to go part-time at work to take care of them, or even quit your job altogether in order to take care of them in the last stages of their lives, but do it. Don’t even question how it will work out. It will be messy and will undoubtedly hurt to be that close in such a precious time, but God will honor you for that decision to give your parents that last bit of your love and care. Also, it is never too early to discuss estate details with them. Make certain they have all their funeral and estate plans in order, a lawyer (and a backup lawyer) selected, and make sure an executor is appointed ahead of time. If they appoint you, you will have a lot of work to do. A trust can make this easier and your folks should consider putting their estate in a trust, rather then letting it go through messy probate issues. And absolutely get a statement of the value of their assets before they die. It can always be revised later, but trying to organize it all under the emotional pressure of their passing is avoidable if done in advance. All the legal stuff aside, the last gift you can give a dying parent is to be there for them in their hour of death. Don’t let anything take that away. Again, God will honor you for loving your parents that way. You only get two chances; let them both be blessed.